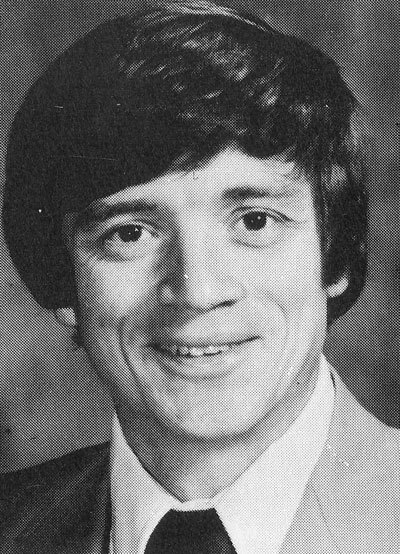 When Tom Dinger graduated from The College of Wooster in 1972, he had established 17 game, season, and career-scoring marks. Not only was he the greatest scorer in Scot basketball history, but he was a ball handler deluxe whose flaming competitive spirit simply pulled his teammates along in his brilliant wake. However, his march was not one of unbroken success. His scholastic career at Mansfield Senior was marred by a success of injuries and illness, which led to his being tagged as brittle. Tom won three baseball letters, but his heart was on the hardwood. He averaged 20 points per outing as a junior; 24 as a senior, including one five-game streak of 38, 41, 30, 26, and 42. Despite those heroics, no major schools displayed interest. When Coach Al Van Wie spoke of a new Wooster gym, Dinger was receptive. His parents, Carl and Joan, plus little sister Debbie were devoted followers, attending all but four of his 96 college games. During that period he tallied 2,370 points for an average of 24.7. This included one string of 37 consecutive games in which he scored 20 or more points. His high of 48 came during his junior year when he averaged 30.7. But scoring was only part of the package as Van Wie changed his offense to take advantage of Tom’s floor play and passing ability at point guard. Dinger made the Ohio Conference second team as a freshman, the first team for the following three years. He won the Gregory Award, emblematic of the OAC’s most valuable player, as a senior. He was voted to the first team NCAA District Four for three straight years. He was selected to every College Division All-America team as a senior. The list goes on and on. Wooster fans still talk about Tom’s shootout with Kenyon’s legendary John Rinka, and about his senior year when he led the Scots to a 23-1 regular season record, including 19 in a row. The apex came in the last home game of the season, an 87-81 triumph over Capital. The preceding year that same Cap team had soundly trounced Wooster, 103-66. Despite his heroics and the ensuing publicity, Dinger changed not at all. He was an unselfish player who made sure that scoring opportunities were spread among his teammates. In addition, his refreshing modesty made him an instant favorite with the Scot’s booster Club, the Downtown Rebounders. After graduation, he accepted a position with Wooster High School where he served as head basketball coach for seven years, winning Coach of the Year honors three times in the Cardinal Conference. Tom has now laid aside his coach’s whistle, but continues to teach at the high school. He is the father of four children: Philip, twins Anna and Sarah, and Noah.